The other day a user at my client site called me up as they were unable to rename a folder within their environment. We won’t get into folders and SharePoint now, that’s a post for another day. Whenever they tried to delete a folder they received the following message: Error: Invalid file name. The file name you specified could not be used. It may be the name of an existing file or directory, or you may not have permission to access the file. The error was received in both the GUI and Windows Explorer. Can she rename the folder? Can she add files to the folder? Check to see if the user has the file inside the folder open. So the other day I was preparing a demo for a BCS presentation I will be doing next month. Everything was working fine right up until I wanted to demonstrate using an external data column within a Word document. For some reason I was unable to set the value of the field from within Word. When I opened a Word document in the library it would pull the field in as set at the library level. 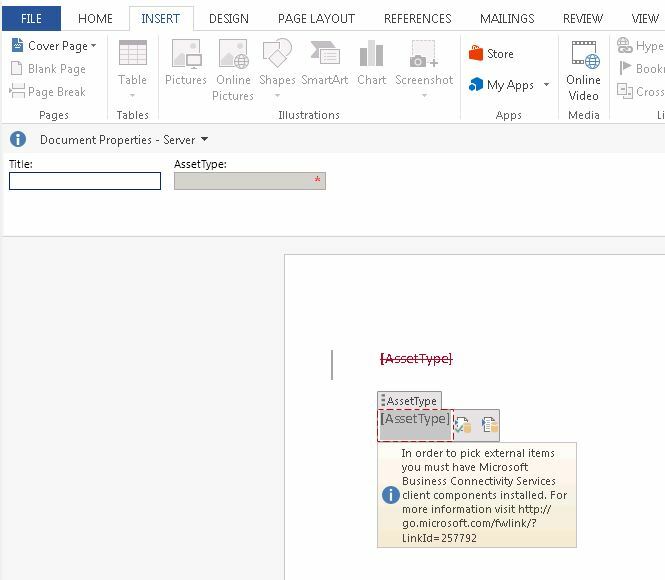 When I added a Quick Part pointing to the field and attempted to make a selection I receive the error: “In order to pick external items you must have Microsoft Connectivity Services client components installed. For more information visit http://go.microsoft.com/fwlink/?LinkId=257792”. Turns out, I simply don’t know how to read instructions :-/ . For BCS client integration, Microsoft states you need to install SQL Server Compact 4.0, .NET Framework 4, and WCF Data Services 5.0 for OData V3 on the PC running the app. When I was preparing my environment I made the silly mistake of thinking since I wasn’t developing apps for the demo I didn’t need to install SQL Server Compact. Once I corrected the mistake and installed SQL Server Compact the integration worked fine. Note: .NET 4.5 is fine.